Avant-garde metal, also known as avant-metal or experimental metal, is a subgenre of heavy metal music loosely defined by use of experimentation and innovative, avant-garde elements, including non-standard and unconventional sounds, instruments, song structures, playing styles, and vocal techniques. Avant-garde metal is influenced by progressive rock and extreme metal, particularly death metal, and is closely related to progressive metal. Some local scenes include Los Angeles, the San Francisco Bay Area, Boston, and Seattle in the United States, Oslo in Norway, and Tokyo in Japan. Avant-garde metal, also called experimental metal and avant-metal, has been called the most difficult heavy metal genre to define and describe. It is characterized by the use of innovative, avant-garde elements, large-scale experimentation, and the use of non-standard and unconventional sounds, instruments, song structures, playing styles, and vocal techniques. The term "avant-garde metal" is also often used as a term for the separate genre of "atmospheric metal" or "post-metal", which was named in reference to post-rock. Avant-garde metal is related to progressive metal, but avant-garde metal often has more experimentation, while progressive metal usually has a tighter focus on traditional metal instrumentation and higher levels of technical complexity. Avant-garde metal also uses unusual sounds, breaks conventions, and often includes new elements. The lyrics and visual presentation of the genre are eclectic as well. 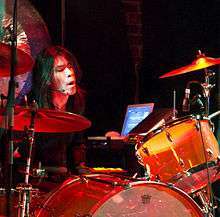 According to Jeff Wagner in Mean Deviation, electronic percussion and drum machines see widespread use by avant-garde metal bands, along with female vocals and operatic elements, all of which he attributes to the influence of the band Celtic Frost. The Canadian group Voivod also influenced future bands in the genre, pioneering technique such as robotic vocal effects, unusual time signatures, and fractured, dissonant, unorthodox guitar sounds. According to Ian Christe, avant-garde metal emerged from death metal as a number of musicians "abandoned the tightly wound structure of the music and experimented with abstractions of its founding elements". Progressive rock has also been cited as an influence. Some early examples are the King Crimson releases Larks' Tongues in Aspic and Red in 1973 and 1974 respectively, with the latter album's title track defining an "avant-metal style" that Robert Fripp would revisit years later. Another early example is the 1976 Led Zeppelin album Presence. Pioneers of avant-garde metal include Celtic Frost, Boris, Earth, Helmet, Mayhem, maudlin of the Well, Neurosis, Sunn O))), Mr. Bungle, and Voivod. In the late 1990s, Misanthropy Records emerged as a promoter of Norwegian avant-garde metal until it folded in 2000, and, according to Jeff Wagner, in the late 1990s and early 2000s, a so-called "new wave of avant-garde metal" was spearheaded by The End Records. Wagner states that "with the support of [Misanthropy and The End Records] and other specialty labels, metal's new avant-garde had arrived." Some other record labels which promote avant-garde metal are Aurora Borealis, The Flenser, Holy Records, Hydra Head Records, Ipecac Recordings, Napalm Records, the Release Entertainment imprint of Relapse Records, Seventh Rule Recordings, and Southern Lord Records. In the United States, local avant-garde metal scenes have emerged in the San Francisco Bay Area with bands such as Giant Squid, Grayceon, and Ludicra, in Boston, with bands such as Isis, Kayo Dot, and maudlin of the Well, and in Seattle. According to The New York Times, some regional scenes that developed in the mid-1990s included the cities of Tokyo, Los Angeles, and Oslo. 1 2 Bowar, Chad. "What Is Heavy Metal?". About.com. Retrieved November 29, 2016. ↑ Wagner 2010, pg. 124, 254, 301-302. 1 2 Martens, Todd (6 January 2007). "Indies on the Verge". Billboard. Nielsen Business Media. 119 (1): 27. ISSN 0006-2510. Retrieved November 29, 2016. ↑ West, Mike (April 12, 2007). "Coming Apart at the Themes". Washington City Paper. SouthComm. Retrieved November 30, 2016. 1 2 3 4 Freeborn, Robert (June 2010). "A Selective Discography of Scandinavian Heavy Metal Music" (PDF). Sound Recording Reviews. p. 842. Archived from the original (PDF) on 31 March 2012. ↑ Buts, Jeroen. "5.1". The Thematical and Stylistic Evolution of Heavy Metal Lyrics and Imagery from the 70s to Present Day (PDF). p. 81. 1 2 Wagner 2010, pg. 124. ↑ Christe, Ian (2004). Sound of the Beast: The Complete Headbanging History of Heavy Metal. Harper Paperbacks. p. 253. ISBN 0380811278. Retrieved 6 August 2011. ↑ Peterik, Jim; Austin, Dave; Austin, Cathy & Lynn, Cathy (2 August 2010). Songwriting for Dummies (2nd ed.). John Wiley & Sons. p. 37. ISBN 0470615141. Retrieved 22 March 2012. ↑ Fricke, David (29 March 2010). "Alternate Take: King Crimson's Royal Remix Treatment". Rolling Stone. Jann Wenner. Retrieved 27 April 2012. ...later turned up on the 1973 avant-metal killer Larks' Tongues in Aspic. 1 2 Mojo (1 November 2007). "4". The Mojo Collection (4th ed.). Canongate Books. p. 337. ISBN 184767643X. Retrieved 27 April 2012. ↑ Fricke, David (5 December 1996). "Aenima". Rolling Stone. Jann Wenner. Retrieved 27 April 2012. Still, the best parts of Ænima come when Tool just let the music rip and dip with the broiling, avant-metal ferocity of Led Zeppelin's Presence. 1 2 Wagner 2010, pg. 109, 117. 1 2 Wray, John (28 May 2006). "Heady Metal". New York Times. The New York Times Company. Retrieved 28 March 2012. ↑ Cummins, Johnson (1 March 2012). "Album of the Week". Montreal Mirror. Quebecor. Archived from the original on 4 April 2012. Retrieved 22 March 2012. ↑ Senft, Michael (6 July 2006). "Warped Tour a hit in new digs". The Arizona Republic. Gannett Company. Retrieved 28 March 2012. Early arrivals were able to see experimental metal pioneers Helmet as well as retro punks the Casualties. ↑ Wagner 2010, pg. 252. ↑ Wagner 2010, pg. 308. ↑ Guyre, Jen (8 February 2008). "Exclusive: Neurosis Q&A". Rhapsody. Retrieved 30 March 2012. ↑ Yuan, Henry (17 April 2010). "Sunn O))) to Curate Roadburn Festival 2011". Revolver. Future US. Retrieved 7 August 2011. Their metal-based drone experiments have proved groundbreaking and hugely influential for an entire new generation of musicians practicing the art of avant-garde metal, drone, post rock and psychedelia. ↑ Deiterman, Corey (28 July 2015). "Faith No More is Back...Could Mr. Bungle Be Next?". Houston Press. Voice Media Group. Retrieved 10 October 2015. 1 2 3 Wagner 2010, pg. 124, 301-302. ↑ Wilson, Richard. "The Haxan Cloak". Allmusic. Rovi Corporation. Retrieved 19 June 2013. Distributed by experimental metal label Aurora Borealis, the release earned Krlic a recording deal with the London-based company. ↑ "THE FLENSER to Release Debut from Animate Metal Sorcerers SEIDR". Blabbermouth.net. Roadrunner Records. 27 January 2011. Retrieved 28 March 2012. ↑ Wagner 2010, pg. 344. ↑ Brown, August (26 August 2009). "In a digital age, vinyl's making a comeback". Los Angeles Times. Tribune Company. p. 2. Retrieved 28 March 2012. ...said co-owner Mark Thompson, who also co-founded and runs the experimental-metal label Hydra Head Records. ↑ Ruggiero, Bob (14 June 2007). "Unsane". Houston Press. Voice Media Group. Retrieved 19 June 2013. ↑ Palmerston, Sean (December 2003). "Draconian Where Lovers Mourn". Exclaim!. Ian Danzig. Retrieved 27 March 2012. ↑ Reesman, Brian (1 December 2001). "Hard Music Billboard Spotlight: Indies vs. Majors: Surviving in a Nu-Metal World". Billboard. Nielsen Business Media. 113 (48): 23. ISSN 0006-2510. Retrieved 27 April 2012.